Having your vehicle temporarily out of commission is enough of an inconvenience. You shouldn’t have to add to it by missing a day of work or tracking down a friend or family member to drive you to and from the dealership. That’s why Applewood Chevrolet Buick GMC Cadillac is happy to offer our shuttle service throughout the Mississauga and Oakville area. Just call us at (647) 952-1709 to arrange your spot in our shuttle vehicle. We’ll drive you in comfort in one of our Cadillac Escalade shuttle vehicles and take you where you need to go! (see route map below). We will come and pick you up at the end of the day to return you to our dealership where your repaired and freshly washed vehicle awaits! How far does the shuttle service span? 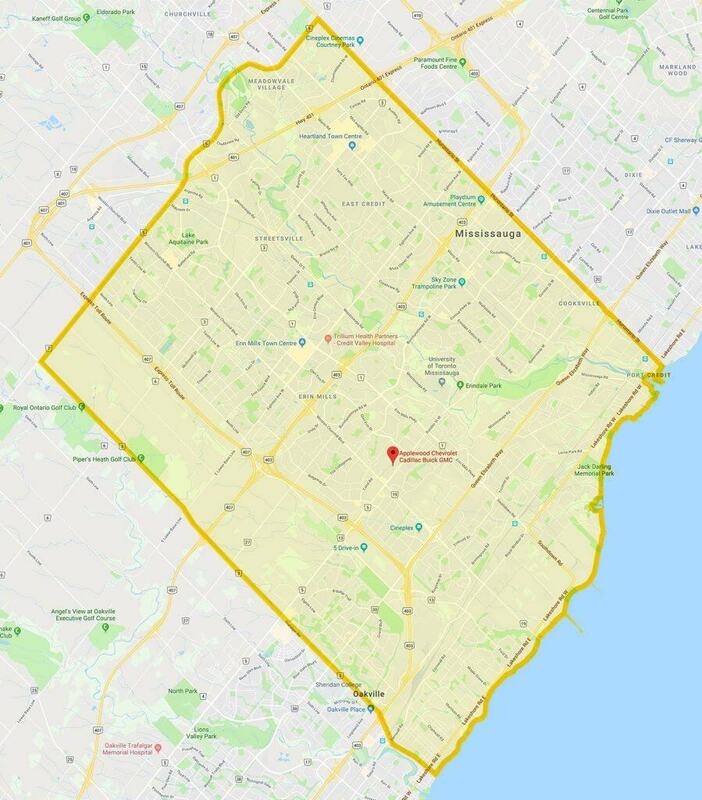 Many of our customers work outside of this range and choose to be dropped off or picked up at any one of the GO Train or Bus stations in this area. This opens up our shuttle service to anyone located throughout the Greater Toronto Area. How long will it take to get picked up? If you haven’t already set up a shuttle pickup with us, you’re not out of luck. But we ask that you please arrange your pickup with us at least one hour in advance to account for possible traffic along the way. You may also arrange for after-hours vehicle pickup, allowing you to show up and collect your vehicle beyond the store hours for our dealership. Please contact us for further details.